Florence is renowned for its artistic history, the city an open gallery full of elegant columns, statues and bronzes. Walk the narrow street in the historic centre, you are bound to discover the statues within Loggia dei Lanzi or Benvenuto Cellini’s bust on Ponte Vecchio or find Italian statesmen of the past in Piazzale degli Uffizi. 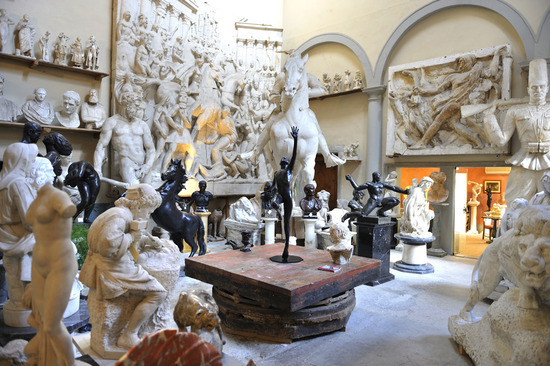 Sculpture has long been a notable skill in Florence with Galleria Romanelli one of the oldest working sculpture studios in Europe. Run by the Romanelli family, five generations of sculptor masters, traditional techniques are upheld. Bronzes, cast in the Lost Wax Method, are created using live models; obelisks, vases, columns, fireplaces, fountains are all reproduced respecting traditions of the past. Located in the artistic heart of Florence, Oltrarno (“the other side of the river Arno”) the gallery was first the studio of famed sculptor Lorenzo Bartolini (1777 – 1850) one of the greatest Italian sculptors of the 19th century. His vast collection of plaster models can be found today in the Galleria dell'Accademia in Florence, where the layout of the sculpture room, just by Michelangelo’s famous David statue, is inspired by Bartolini’s studio arrangement on Borgo San Frediano in the 1800’s. This layout at Galleria Romanelli remains today. Originally a church in 15th century, today the space functions as a gallery and studio where impressive 25-foot high sculptors from the 18th century stand under 16m high arched ceilings. Pasquale Romanelli (1812-1887), Bartolini’s favourite pupil, became his successor and in turn evolved the studio into an art gallery in 1860; today, the gallery is run by Raffaello C. Romanelli, a fifth generation sculptor in the family. Growing up in such an historic yet creative environment was inspiration for Raffaello who specialises in portrait busts, offering clients the unique experience to model and have an original bust created in plaster, bronze or marble. The studio can also create reproductions of classic works from the family archive plus functions as a studio for classes, be it private or small groups, with courses dedicated to clay modeling, plaster casting or marble carving. The Galleria has recently been restored and is open to the public to view hundreds of incredible sculptures made by several generations of Romanelli. The space attracts a mix of art lovers, collectors, architects, interior and exterior designers searching for unique, decorative artworks. It is an original gallery space with an extraordinary history - next time you are walking over the historic Ponte Vecchio in Florence, take a moment to stop and admire the bust of Benvenuto Cellini by Raffaello Romanelli the elder. For not far away, in the nearby San Frediano neighbourhood in Oltrarno, is the studio where this sculpture was created, a place you too can visit offering a true Florentine experience like no other.